Splashy Dots has one of its kind mechanics that can’t be found in any other game. If you like games such as chess, Sudoku, Go or Rubik’s cube you will be amazed by how much this game has to offer beyond the art style. Thousands of brain-teasing puzzles. You can choose colors and difficulty up to your preferences. Designed specifically for iPhone, iPad, Apple TV, and iMessage. Works with haptic feedback and force touch on iPhone 7, which allows you to feel the splashes in your hand. Splashy and juicy graphics with lots of colorful themes. Each level ends up as a painting for you to collect. Full undo support so you can experiment freely with multiple paths. Hints to help you when you get really stuck. Easy to learn rules with surprising complexity as levels get harder. Chillout Jazz music playing in the background with procedurally generated tunes that are different at every level. Progress is saved in the cloud so you can play on multiple devices at once. The game is visually driven but the core of the gameplay is focused on strategic thinking. Your goal is to connect all the dots. Sounds familiar? Nothing could be further from the truth. Splashy Dots has one of its kind mechanics that can’t be found in any other game. If you like games such as chess, Sudoku, Go or Rubik’s cube you will be amazed by how much this game has to offer beyond the colorful art style. You move the dot with swipes so in order to play this game you need a single hand and an open-minded brain. Your dot moves on a visually appealing grid that lets you easily understand the in-game physics. You can move horizontally or vertically within this grid. There are only splashes and paint streaks. Whenever you swipe you create both – a streak and a splash. The in-game music is relaxing and your moves are accompanied by calming sound effects. At the beginning the game is easy, but it gets more brain-challenging with each level you complete. It’s easy to finish initial levels which contain only a few dots but you need to learn how to test your strategies in order to finish levels with a dozen of them. You need your combined experiences to progress in the game. There’s always at least a single possible solution but usually, the first move is the most important one. It can immediately help you solve the puzzle or break the odds of winning. The world of Splashy Dots is full of colors. Gameplay will make you excited. It’s addictive and challenging. Whenever you get stuck you don’t need to stop – there’s a hint that you may want to use. There’s no such thing as a score so you don’t need to hurry. Take your time, be patient. 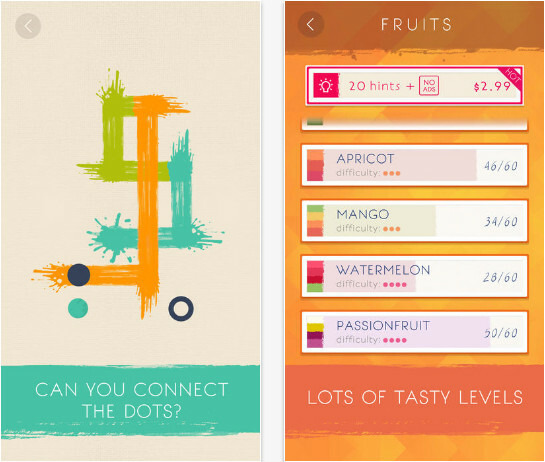 Test your skills and try to solve one of the most creative modern puzzlers. If you own AppleTV you need to know that the Splashy Dots TV version was not only specially designed for TV, but the game will be synchronized across all your devices, whether it’s iPod, iPhone or AppleTV. Not convinced yet? If you play on AppleTV you will get daily free hints! Yup, that’s it. You only need to download the game on your AppleTV in order to receive free hints on iPhone.